A new plastic garden shed from KETER provides storage where space is at a premium. 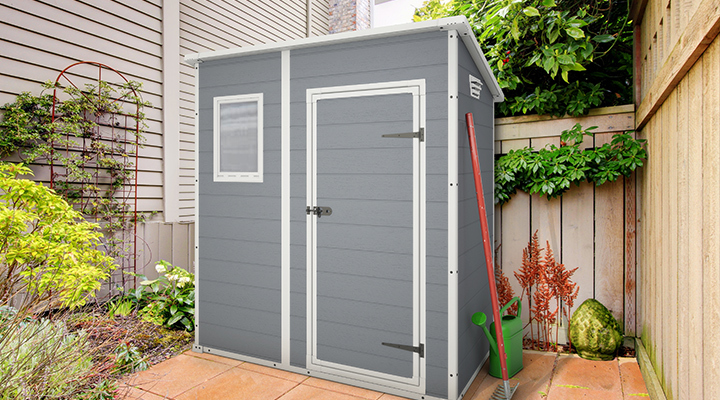 A new plastic garden shed, the KETER PENT 6 x 4, is specifically designed to meet the need for economical compact outdoor storage in situations where space is at a premium. With a floor area of almost 2.0 square metres and a maximum internal height of just under 2.0 metres, it can cope with a surprising amount – brooms, mops and buckets, gardening tools such as rakes and yard brooms as well as toys, bikes and sporting equipment. The panels are a strong double wall construction manufactured from UV-stabilised polyethylene resin plastic formulated for outdoor applications, and as with all KETER plastic garden sheds, the floor is an integral structural component. This allows you to install the shed on any firm, level site and saves the expense of a concrete slab or timber floor – a factor which deserves consideration, as the cost of a concrete or timber base can run into some $100’s. Ongoing maintenance is minimal with good quality plastic garden sheds – they will not fade, scratch or dent as steel Color and Zinc sheds are prone to do, (especially low-cost units which are made from very light gauge materials). An occasional wash down with the hose will keep the PENT 6 x 4 looking like new. If you would like to find out more about the complete plastic shed range, including units from Palram and Lifetime, CLICK HERE.